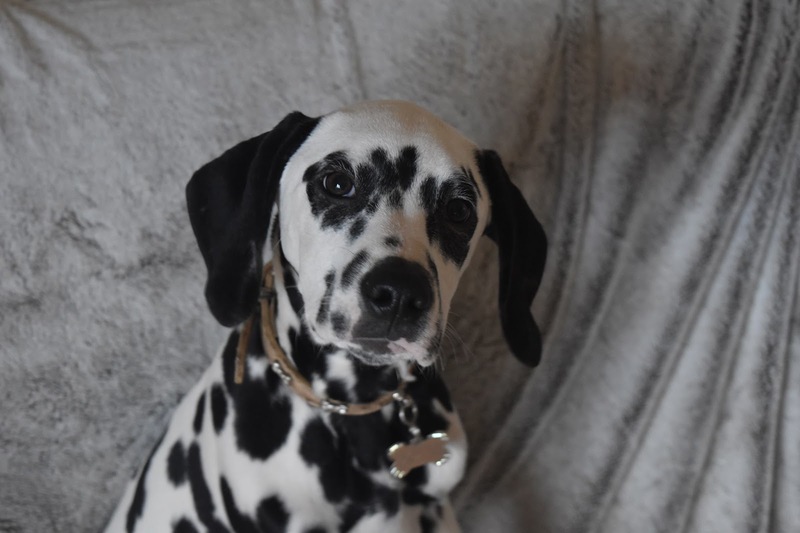 Hello lovelies, look at this weeks pet of the week Dottie what a gorgeous dalmatian owned by a blogging friend of mine Zoe. 1. What is the name of your pet? Dottie, she is my spotty love. I've wanted a Dalmatian for as long as I can remember for my 25th birthday I finally got my wish. 2.What is Dottie's favourite thing to do? It seems she loves digging everything in which she isn't meant to. But loves playing with her toys too. 3. What is Dottie's favourite treat? Anything meat based is a big hit. 4. What do you love doing with Dottie most? We love taking lovely strolls, we enjoy visiting the forest and running around. 5. What made you give the name Dottie? Think this one is pretty obvious. I've always wanted a Dalmatian called Dottie, my family thought I was joking when I finally got her but nope, Dottie it is. 6. What's the thing you love most about Dottie? I love her spotty slobbery cuddles, she is just like having another baby with how she cuddles up. 7. Has Dottie got a funny story or even a bad one? Dottie is currently only 6 months old, in the short space of time shes dug up our brand new artificial lawn, dug up the sand surrounding our patio, ripped up the lino flooring within our kitchen (new build only been here 18 months) and scratched a hole in the kitchen wall. Yep you could call her a trouble maker. 8. Can Dottie do any tricks? She hasn't really mastered any yet apart from the usual Sit, Down, Stay. We are learning 'Paw' which we have almost mastered. 9. If you could give Dottie anything what would it be? I'd give her a big open space with plenty of distractions to keep her occupied along the way. 10. Some facts about Dottie? Dottie was born 364 days after my youngest daughter, meaning her birthday is the day before (won't be forgetting that one). Thank you so much for sharing Dottie Zoe, she is gorgeous. When I was little I loved 101 dalmatians and always wanted one but I also had an obsession with oddball, the one who had no spots aha, she is such a pretty dog though her ears look like soft velvet! I just want to cuddle her. I want a dog too!!! She's stunning!! !